In pretty much any town or city in Ireland, you’ll see nods to some of the country’s favorite suds and spirits: a Guinness sign here, a whiskey* barrel there. So during our two days in Dublin, we decided to pay homage to two of Dublin’s most traditional industries – distilling and brewing. When in Rome, right? 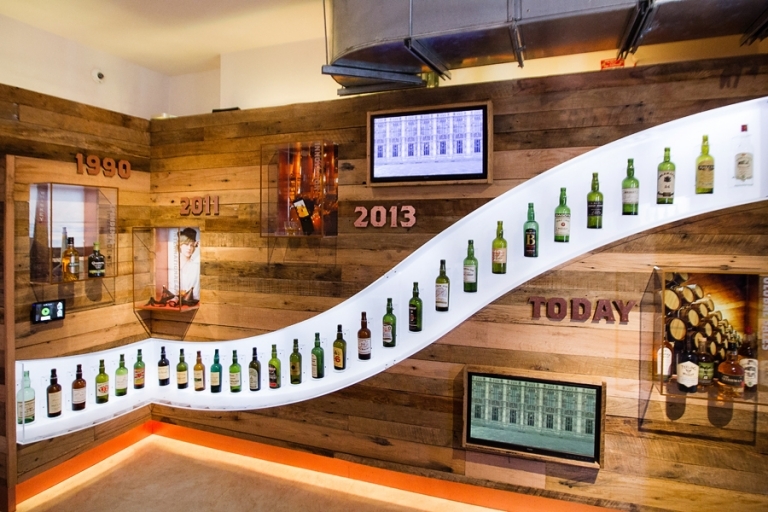 We started off with a fantastic tour of the Irish Whiskey Museum, which turned out to be the perfect introduction to the process of making whiskey – information that would come in handy a week later when we headed to Scotland. As someone who abashedly craves instant gratification, it was interesting to hear about the labor of love that results in a final product that can take a dozen years to make. The informative and entertaining tour was 15 euros and it lasted about an hour with a tasting at the end. Chris upgraded to the VIP tour at 18 euros and received an extra whiskey to taste plus he received a souvenir glass. After the tour, Chris and I sampled a few different Irish whiskeys. I should note that my participation in the tasting involved taking tiny bird sips of each taster, and then passing the rest of the whiskey onto Chris. 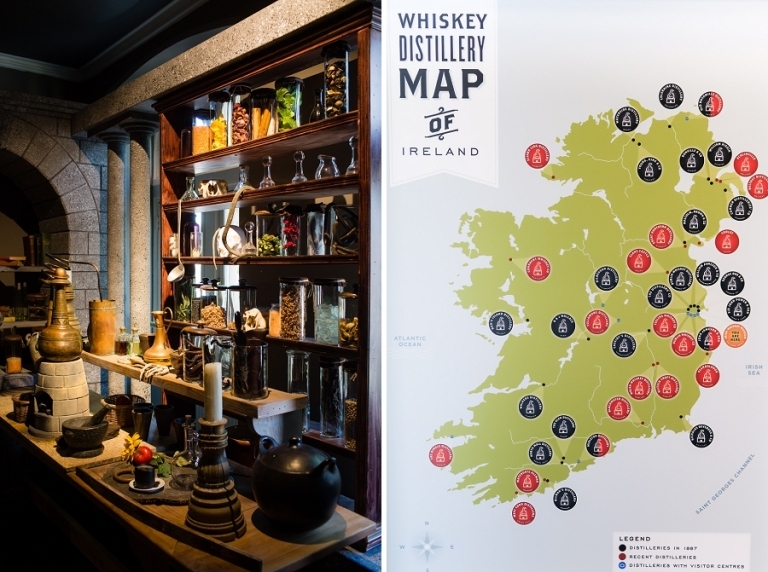 Over the course of our two-week trip to Ireland and Scotland, we visited ten distilleries and I tried to find a whiskey/whisky that I like, I really did, but it’s just not my thing. ‘A’ for effort though? I had fun trying. So, speaking of distilleries, the Old Jameson Distillery was our first of the ten. Located on Bow Street in Dublin, the Old Jameson Distillery is no longer a production facility, but the re-creation is no less fascinating. We arrived just as it started to rain and this was the perfect option to escape the dreary weather (15 euros each for a one-hour tour with a tasting). It was also here that I found a way I can enjoy whiskey – Irish coffee! Chris and I ate lunch upstairs in the 3rd Still Restaurant while waiting for our tour to begin and we ordered a real Irish coffee. I didn’t expect to like it since I don’t drink whiskey OR coffee, but apparently when you put the two together plus a good amount of sugar and fresh cream it magically becomes something delicious. Between you and me, I didn’t expect to thoroughly enjoy the tour either since the distillery isn’t operational and I assumed a fake distillery would be a little dull, but the tour is done quite well and our guide did a fantastic job of engaging the participants. Plus the whiskey at the end is entirely real, and booze is always fun, right? Our guide led us through a comparative tasting where we sampled a Scottish whisky, an American blend, and of course good ol’ Jameson. I was surprised to discover that Jameson was the easiest for me to drink (or rather to bird-sip). Next up is our trek to the Guinness Storehouse since it is often said that no trip to Dublin is complete without a St. James Gate Brewery visit. Well, I hate to be a party pooper and my opinion might be an unpopular one, but I wouldn’t put the Guinness Storehouse in the number one spot on my Things To Do In Dublin list. At 20 euros each for admission, this isn’t a cheap tour, and because the museum is on so many must-do lists, I think my expectations were perhaps a bit too high. On the plus side, the expansive museum can handle the volume of guests for the most part. We visited on a Saturday evening along with hundreds and hundreds of other people, but I never felt like anyone was crowding me. That is, at least until we got to the Gravity Bar – more on this below. There are some beautiful displays and I appreciated the graphic design elements of the museum, but a lot of the information and history is delivered via videos and we had a hard time hearing the audio in a room full of excited tourists. 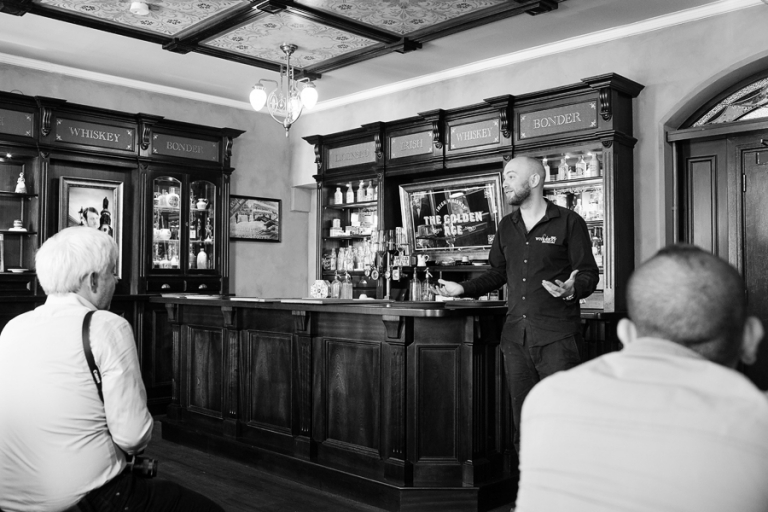 The best part of the tour is without a doubt the lesson on how to pour the perfect pint. We waited in line for about twenty minutes before our group took a turn at the tap. A Storehouse guide gave us a fun lesson and we learned the exact science that goes into pouring a pint of Guinness. We also took a group photo behind the bar where it looks like I’m chewing on the tap handle. Composition (and lighting) issues aside, it was nice that they offer to send the complimentary image file to your email address – all you have to do is fill out your information at a kiosk. I was looking forward to drinking that perfect pint upstairs in the Gravity Bar where you can take in a 360-degree view of Dublin, but when we arrived we found standing room only (barely) and nary a wee bit of space to sit or set our glasses. At that point my feet were tired from touring and from standing in line and I just wanted to sit down, so I was pretty frustrated. We still enjoyed perusing the enormous gift shop downstairs and purchasing a Guinness caramel chocolate bar helped to soothe my woes. I recommend the Storehouse visit to anyone with a love for beer, but I would recommend going during non-peak hours and buy advance tickets online to save a few euros. Chris and I finished our alcohol-fueled tour of Dublin in the famous Temple Bar district. We didn’t spend much time here though – we were still battling the jet lag and couldn’t hang! Our intention was to grab a drink at Temple Bar as one of the tourist checklist items, and then to check out the scene where the locals drink, but the time difference and a very comfy hotel room got the best of us. Next time! *Please note the correct use of the spelling of whiskey here vs. whisky when referring to the version from Scotland.